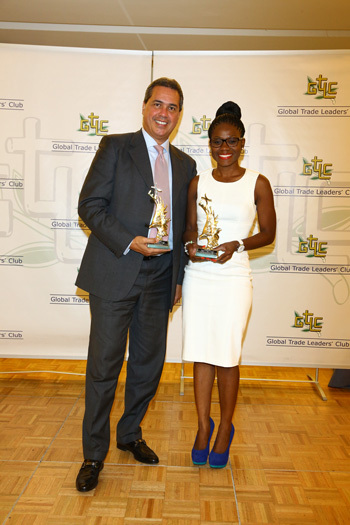 Ricardo Roso Lopez (L), GTLC Secretary General and CEO presents SXM's Corporate Communications Specialist, Kalifa Hickinson the International Award for Business Excellence. 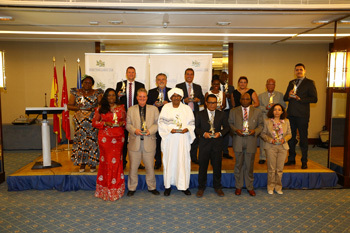 Award recipients pose for a group photo. SXM's Corporate Communications Specialist, Kalifa Hickinson with fellow award recipient, Nestor Herrera, Director of Curaçao-based Petro Industrial N.V.
SIMPSON BAY, St. Maarten (June 30, 2014) - Princess Juliana International Airport, SXM, was the proud recipient of the International Award for Business Excellence by the Global Trade Leaders’ Club (GTLC) on June 30, 2014 in Madrid. Corporate Communications Specialist, Kalifa Hickinson, accepted the award on behalf of SXM. According to GTLC, the International Award for Business Excellence, which has been celebrated yearly for the past 25 years, was created to distinguish firms from every industrial branch whose products and services have deserved universal acclaim along the course of the year. The award recognizes and promotes the organizational qualities and philosophies that allowed each company to achieve excellence. In her acceptance speech on behalf of Managing Director, Regina LaBega, Hickinson used the opportunity to highlight not only SXM Airport, but St. Maarten as a viable destination in the Northeastern Caribbean. “I can assure you that there is no destination like St. Maarten. I therefore encourage you to make the time to visit us. We offer more than sun, sea, and sand; we offer an exciting slice of paradise and an intense night-life that has earned us the sobriquet of “The Las Vegas of the Caribbean,” Hickinson told the audience. 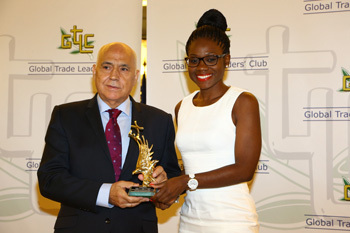 GTLC, an association of leading businesses which gathers more than 7,500 members from 95 different countries, organises the granting of several International Trophies to enterprises from all over the world as an encouragement and a recognition of their work, devotion, innovation, and quality to develop the industry and trade in their own countries. “It was an honor to accept this prestigious award on behalf of SXM Airport. We will continue to build on this recognition as we work to consistently create an experience that moves each of our passengers,” Hickinson concluded.